Here’s an update on the death I reported in my previous post. The death was reported last Thursdy evening, and the search for the body continued for several days. Meanwhile, at the house of the deceased, dozens of mourners visited over the weekend. I went there on a few evenings to join the 20 or so people who gathered at any one time of the day. The mood was anything but somber. Folks were drinking Beer Lao, of course, talking and laughing, playing cards and generally having a good time. It must have resembled an Irish wake, but there was still no body. Dawn came grey and pale on Monday, the sun shrouded by a thin overcast. I was up about 6:30, drinking coffee and plotting revenge against the early-crowing roosters. There was a flurry of activity as first one of Nai’s sister’s husbands and then another scrambled for their motorbikes and raced away. My first thought was that the body had been found and indeed it had. The two husbands, one of Nai’s brothers and many of the workmen had been searching for the body the past several days, and finally, that morning they’d been successful. Nai and I hurried off on his motorbike and joined the throng of people at the work site, which is only about three kilometers from Nai’s house. The body hadn’t drifted downstream after all, but had remained where it had fallen. The Mekong is very muddy around this area because of the dredging operations, so the search had taken some time. The only thing that makes sense to me is that the man had walked to one of the smaller dredge boats across a narrow pontoon bridge consisting of a large plastic or metal pipe. No body else saw him go out there. He must have slipped and fallen at some point, struck his head against the pipe or boat, and gotten knocked unconscious as he sank beneath the water. By the time his absence was noticed, it was too late. The body, unnaturally white and grotesquely bloated, had been placed on the shore. As I watched, a couple of the men wrapped it in a clear plastic tarp, wrapped it again in a blanket and tied the bundle with strips of white cloth. Plastic bags filled with the dead man’s possessions were placed next to the bundle, and some of the men lined the corpse with unlit incense sticks. A few other men poured several bottles of water over the mound, I suppose as an act of purification. Then there was a wait of about an hour, so all the relatives and friends, far from being downcast, sat around and talked and smiled and laughed. Curious people of all stripes, including a lot of school kids in their uniforms, came and left. Finally, a brown wooden box, the same color as the soil along the river, was brought to the site. The corpse was placed into it and the top was nailed shut. Then half a dozen men carried it about 100 meters to a large pyre composed of dried brown driftwood and old, dusty truck tires. The driftwood nearly perfectly matched the color of the casket. The box was placed on the ground and the top was removed. Mourners, many in tears, gathered around the body as the man’s possessions were stuffed into the casket. Some people placed money inside. Nai pointed out the dead man’s father. He was grey-haired, about 60, and his handsome, wrinkled face was covered in tears. I was about ready to burst out myself. The cover was then nailed shut again, and the box was placed on top of the wood. All the mourners picked up an orange flower from a pile that seemed to appear out of nowhere, and we tossed them onto the pyre. One of the younger guys doused the wood and tires with gasoline, someone touched a flaming piece of wood to several areas on the pyre and the whole thing burst into flames, black smoke billowing into the sky. Dredging operations several hundred yards up and down stream from us continued unabated. We watched for awhile, then hopped on the motorbike and departed the area. Back at Nai’s house, I could still see the smoke, dark against the pale sky. Because it would have been completely tasteless of me to run around taking photos of the people and the wrapped body, I only snapped off one shot, and this only after I saw others taking pictures with their cellphones. 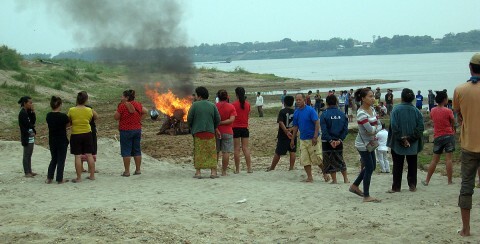 Here’s a view of the cremation and the watchers. It was all pretty sad, but, curiously, not morbid or overly mournful. This had not been a ritual. The Buddhist rites had been carried out at a nearby temple a few days earlier while I was still in Vientiane. This was, it seemed to me, a process to dispose of the body in a respectful manner. While I was living in Korea, I talked to Nai almost daily. It seems that at least once, sometimes twice a month there was a death, either of a cousin or of an acquaintance in the neighborhood. Most of the deaths were of older folks, but occasionally one of the younger ones died. The people around here seem to live with dying on a continual basis. I think the Buddhist principle of the impermanence of everything helps see them through these trying affairs. Let’s hope that there are no more deaths in the extended family for a long while.